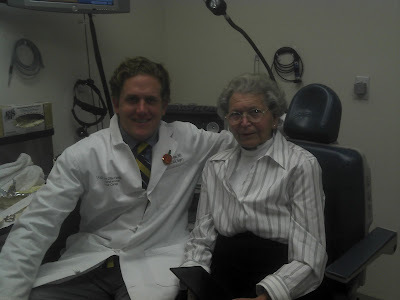 On Tuesday, Mom had her first follow-up visit with Dr. Ryan after his return from vacation. The appointment was to check the fistula and see how she was doing in general. She had a nice visit with him. He was pleased with her progress, despite the minor set back of the leak. He advised her to be patient for the healing to occur. Her dosage for the thyroid has been increased again. Hopefully this will aid in her healing process as well. She can begin physical therapy when she feels ready. She will resume with the P.T. 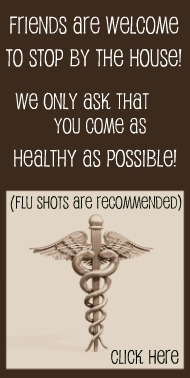 's at Synergy and we will continue to go down to UCSF for bi-weekly check-ups with Dr. Ryan. Today, she is playing bridge at Mrs. Kerr's house here in Napa. This is the second time this week she has gone "out" for bridge. Today is her Thursday group. It's just wonderful that Mom is well enough to do this again!! Last weekend, she began working on her pins for upcoming holidays. Halloween is next - so we can expect pumpkin pins!! Another thing Mom is getting good at is talking on the telephone. 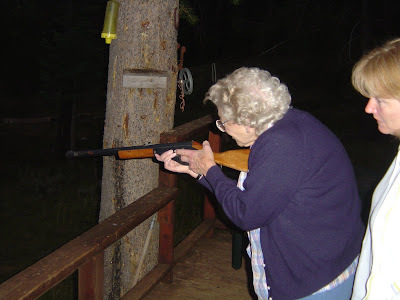 She is able to initiate outgoing calls utilizing her computer and a speaker phone. She is becoming quite adept at using a program called Etriloquist. It is a text to speech program that translates words she types into the computer - to speech. So if you get a call ..... the voice may not sound like Mom .... but she will identify herself by saying "Hi, this is Mary!" Over the holiday weekend, Mom and two of her sisters went out for a relaxing pedicure. She had another visit with Dr. Wang on Tuesday to check the fistula. He observed that it continues to slowly heal. We go back next Tuesday to see Dr. Ryan. He is returning from a two months vacation! She is looking forward to seeing him and having him see how well she has recovered from the surgery. I know he will be very proud of her! Mom has been enjoying the holiday weekend so far. She took a nice long walk ALL the way around Seneca! Also, she has been catching up on potting some plants. She has such a green thumb, she can take a slip from anything and turn it into a thriving plant. We have all been the fortunate recipients of her talents. Mending - she always has EVERYTHING we need! Target practice - is she awesome, or what? Over the years, we have had so much fun - listening to all her stories, learning the right way to respect the cabin and just how to have a great time and enjoy ourselves - THANK YOU MOM - WE MISS YOU THIS YEAR - BUT NEXT YEAR WILL BE GREAT HAVING YOU BACK WITH US. Mom's bridge group has been absolutely wonderful to her. 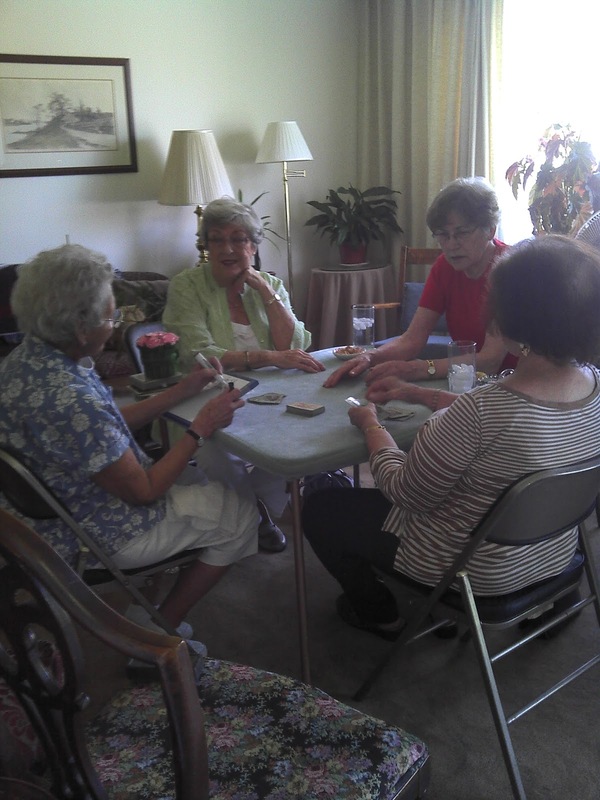 They have been coming once a week to play a few hands of bridge for the past several weeks. 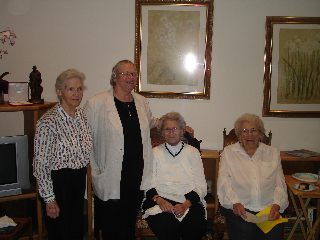 Elaine Waechtler, Joyce Brown, Verna Kerr, Hilde Schrette, and Lore Duser - thank you ladies!!!! Mom eagerly looks forward to your visits each week and is hoping to join you next month in playing at the usual gathering. On Monday we met with Dr. Healey here in Napa. This is our local ENT. The doctors at UCSF wanted Mom to "check in" with them so they were "up-to-speed" with her current status. Dr. Healey had just moved into her beautiful new offices! We saw Dr. Wang yesterday, he checked the fistula and reviewed her labwork. He had decided not to do the Swallow Test just yet. The leak is slowly getting better and we will continue to care for this at home and return to the clinic to be checked weekly. Her labs showed an elevated Thyroid, so they have adjusted her medications accordingly. Dr. Ryan removed a portion of her Thyroid gland during the Laryngectomy. The Synthroid medication will need to be monitored in the future to be sure this hormone is in balance. Having it at the proper level will aid in her bodies' ability to heal. Tomorrow, we check in with her PCP, Dr. Jewell. We are all looking forward to the Labor Day Weekend. 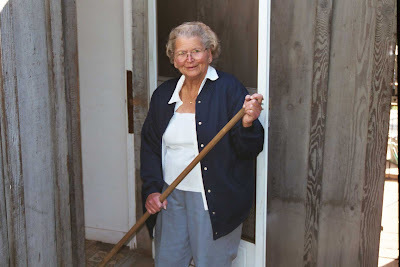 Sr. Anne will be home in Napa for a needed rest and visit with family. Mom always looks forward to her visits. 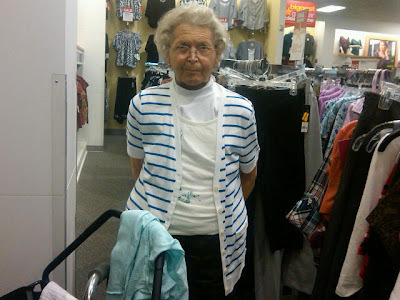 Mom has been doing very well the last week or so, despite the reappearance of the leak she had back in the hospital. 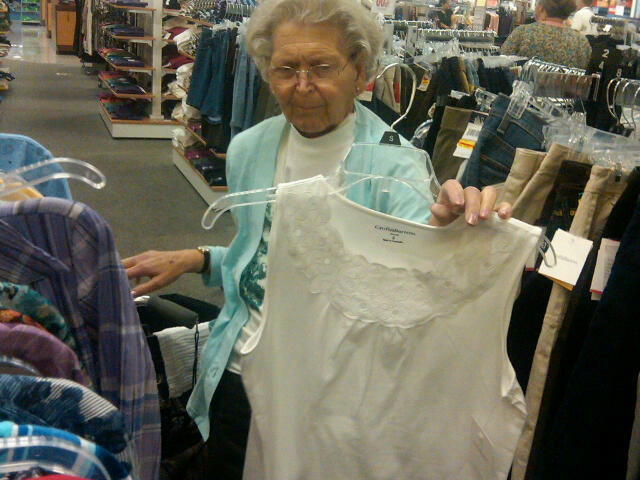 Today she and Margaret did some shopping! Here are a few pictures from their excursion. You gotta love Kohl's discounts! Another white top - Mom, lets go for some color! Stripes, now there's some jazz!!! 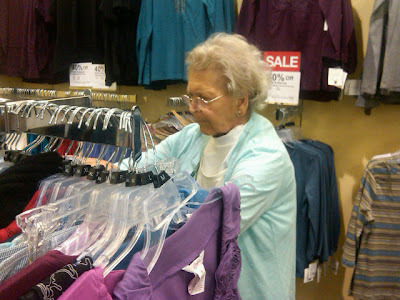 How she loves to shop - just what she needs ..... more clothes!! We made an unscheduled trip to San Francisco on Thursday due to some fluids escaping from her incision. Dr. Burke troubleshooted this to be saliva leaking through a fistula somewhere along her esophagus. We go back on Tuesday for a Barium Swallow Test. This will define exactly where the leak is and just how big it is. They will develop their plan of attack for the leak after reviewing the results from the test. Mom achieved a very important goal on Sunday - she attended the celebration for Sr. Anne at St. Mary's in San Francisco! It was a wonderful event and we were all so very, very proud of Sr. Anne. After the service we went over to St. Rose Convent for a reception, honoring Sr. Anne. There were so many people at the party and all were amazed to see Mom and how well she is doing. She enjoyed visiting with all the family, friends and religious. On Monday we were back in the City for an appointment with Dr. Wang. He removed the drain from the surgery site and also the salivary bypass tube. Mom was such a trooper! It was an unpleasant procedure having the tube taken out through her mouth, but as we would expect - she handled it with incredible toughness. I think the doctor was surprised at how tough she actually is! She is scheduled to have a Barium Swallow Test on August 30th, and then meet with the speech pathologist and Dr. Wang immediately following. This test will show whether or not she is ready to begin taking liquids orally. Let's keep our fingers crossed for that one! We also got to see a few of our friends, the residents that took care of Mom daily at Mr. Zion. Dr. Burke, Dr. Cheng and Dr. Pross were all at the clinic while we were there. It was nice to see them again, and for Mom to show them how well she is doing. I think she could truly be their "laryngectomy poster child"! Today, we will be going back down to San Francisco to meet with Dr. Nakakura, a Gastrointestinal doctor. He will check Mom's feeding tube to be sure all is well in that area. This should be a quick, routine check and we will be on our way back to Napa. Mom is handling these trips back and forth to San Francisco really well. I will post again soon when we have more updates. Mom saw the Joel Duguay today at Microtone to have her hearing aids adjusted. It was a success!! It was actually quite impressive to see how it was done. Since Mom has digital aids, he was able to connect them to his computer while they were in her ears. He loaded his special program, displayed it onto a huge flat screen tv and slowly, methodically tweaked the decibel level input for each ear to a level which was most comfortable to Mom. When we left - Mom could hear!!! Yay!!!! Tomorrow morning, we expect a visit from Msgr Joe of St. Apollinaris. Later in the afternoon, her bridge group will be by to play a few hands of cards. It's wonderful to see her socializing again! Mom's best physical therapy has been walking. 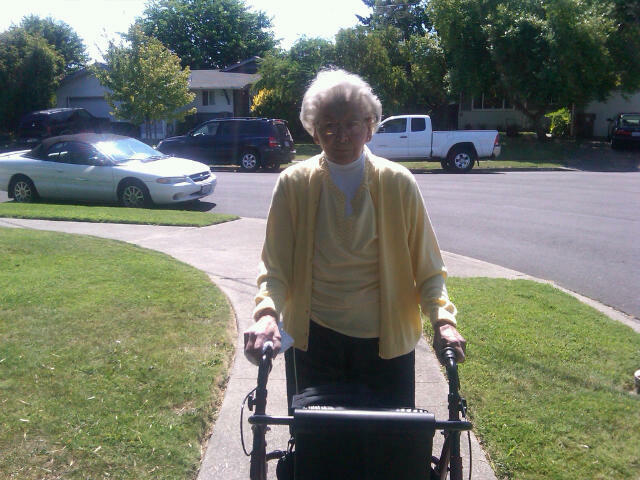 Each day, she goes out front for a walk along the sidewalk. First, down to the Hardister's house and back to home. Then she goes in the other direction, down to the Yeske's and finally back home. In the beginning she was very cautious, but now she walks standing tall with confidence. We just returned from the afternoon walk. 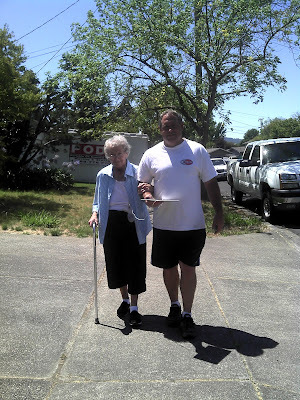 She had a nice visit from her friend Hildie Schrette earlier, who brought her some goodies from Napa's Relay For Life, which was held last weekend. Mom usually attends this event but just wasn't strong enough to go this year. Next year, for sure we will be there! This past week was busy, but productive for Mom. Next week, she only has one appointment - with Microtone for a hearing aid adjustment - let's hope they can get them working so she can hear better! Today was a very, very busy day for Mom. It began by awaking at 5:00 am - an early rise was needed to be ready for a 6:30 am departure to San Francisco! Tim and I loaded the car up with all her special medical equipment and got on the road to UCSF. The first stop was for an audiology appointment with Dr. Cramer at 8:30 am. He performed several hearing tests on Mom, which indicated her recent hearing loss is most likely related to fluid and swelling caused from the surgery. Next stop was to deliver a very well deserved gift of See's candy to the men and women of 5 North. It was a busy morning up there, but we were able to sneak a quick chat with Sann. Thank you again ladies and gentlemen - we love you for all the wonderful care you gave to Mom! The final stop was for a 10:45 appointment with Dr. Wang. He is covering for Dr. Ryan while he is on vacation. We were running early - but that gave us a chance to have a lovely visit with Zsa Zsa, one of the practice assistants that has adopted herself into our family. Zsa Zsa was the SUPERWOMAN that orchestrated all of Mom's appointments, biopsy and surgery at UCSF. She is delightful and just loves Mom. We had a nice surprise while at the Head and Neck clinic today - Dr. Seth Pross popped his head into the exam room while we were waiting! Dr. Pross was one of the four outstanding residents that made their rounds daily at Mt. Zion. This group of young doctors were totally inspiring, with their bright smiles and encouraging support they gave Mom each and everyday. The visit with Dr. Wang was spent mostly discussing the fistula that occurred while in the hospital. When she was discharged, she went home with one drain remaining in the surgical area to remove the excess fluid leaking at the site of the fistula. Since the drain is still capturing fluid, Dr. Wang felt it prudent to leave the drain and the salivary bypass tube in place for a couple more weeks. We will return on August 15th to have this checked again. He did concur with the audiologist that the hearing loss is due to fluid and will improve - hopefully soon! The trip home was uneventful. Thanks to a borrowed inverter from Tom, Mom had a breathing treatment while cruising along 101 North. 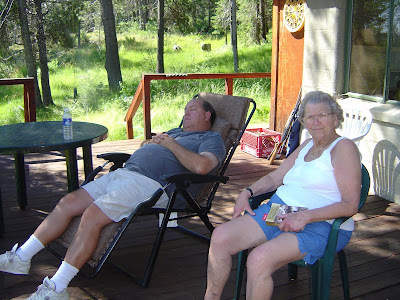 Once home, the afternoon was spent resting. She is looking forward to a game of bridge tomorrow morning with a group of friends! Later in the afternoon she will check in with her cardiologist, Dr. Sergio Manubens. A big THANK YOU to Tim for taking the time out of his busy schedule to help Mom and I get to and from the City! Mom has been doing really great the last few days since my last post. Each day is a similar routine from the previous day. It's all about healing and getting stronger. The incision area from the surgery has healed wonderfully. The PEG tube is holding nutrition really well, which means we are getting lots of calories into her - to help with the healing and strength building. Walking is the best for her, which we encourage her to do frequently. Today is a breezy but sunny day here in Napa. 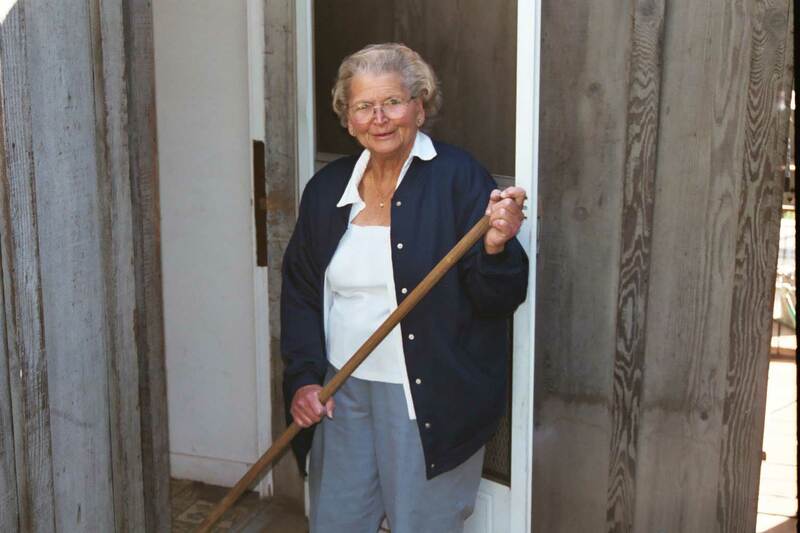 Look - no walker, just a cane! Visitors are welcome! During this phase, until she can be more independently mobile - her days are spent quietly at home. It brightens her day to have company - so please don't hesitate to stop in for a quick visit. 1. Click the COMMENTS link under the post. 2. Post your message to Mary in the blank field. 3. Under your message, you will see a COMMENT AS field. Click the drop down menu and select NAME/URL. Enter your Name (it's ok to leave the URL field blank.) If you have a Google Account, you can log in with your profile information. 4. Type in the word verification and hit POST COMMENT. 5. Your comment will be visible after approval.